The technology at work in laser-based stereolithography (SLA) and digital light processing (DLP) 3D printing follows very similar principles, but can produce significantly varying outputs. Understanding the nuances to each 3D printing process helps to break down what a user can expect from final prints, and how to effectively maximize the potential of each type of machine. The word “stereolithography” comes from the Greek words &ldquo;stereo,&rdquo; meaning solid, and &ldquo;(photo)lithography,&rdquo; which is a form of writing with light. In 3D printing, stereolithography does just that: drawing solids with light. 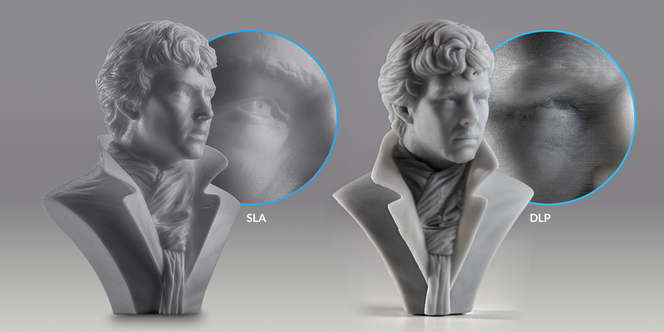 SLA technology uses light to turn liquid resin into a solid object, one layer at a time. By definition, both laser-based SLA and DLP are types of stereolithography, but drawing a layer with lasers can be completely different from projecting layers as a flat image. Let’s dive into what exactly that means. Mirroring industry terminology, we’ll hereto refer to laser-based SLA simply as “SLA.” For both SLA and DLP, a vat of photoreactive liquid resin is selectively exposed to light in order to form very thin solid layers that stack up to create one solid object. SLA 3D printers use two motors, known as galvanometers or galvos, (one on the X axis and one on the Y axis) to rapidly aim a laser beam across the print area, solidifying resin as it goes along. This process breaks down the design, layer by layer, into a series of points and lines that are given to the galvos as a set of coordinates. DLP 3D printers use a digital projector screen to flash a single image of each layer across the entire platform at once. Because the projector is a digital screen, the image of each layer is composed of square pixels, resulting in a layer formed from small rectangular bricks called voxels. The fact that the basic units of the two processes are different shapes makes it difficult to compare the different machines by numerical specifications alone. Dig into what 3D printer specs really mean, and get tips for effectively evaluating which 3D printer is right for you. DLP printing can achieve faster print times for some parts, as each entire layer is exposed all at once, rather than drawn out with a laser. This faster print time applies in two cases. For large, fully dense prints, where the print will fill up much of the platform, each layer is exposed faster than it would be if drawn out by a laser. For very small, finely detailed prints, it can be possible to swap out projector lenses according to the area of build volume, and consequently use a narrow amount of light to more quickly build small layers. Though faster, printing full volume with DLP 3D printers introduce tradeoffs in resolution and surface finish, whether with large parts or sets of many smaller, finely detailed parts. DLP 3D printers are unable to print high-resolution parts that fill up a large portion of the build volume. For example, a DLP printer is able to print one detailed ring well, and more quickly than an SLA printer. However, printing many detailed rings at once would require an SLA 3D printer, capable of consistent high resolution across the whole build volume. Read more about the difference between resolution and minimum feature size, understanding X-Y resolution, and understanding Z resolution. DLP 3D printers' resolution depends on the projector, which defines how many pixels/voxels are available. For example, full HD is 1080p. The projector in a DLP 3D printer must be focused to an image size in order to achieve a given X-Y resolution. When small pixels are desired, this constrains the overall build area by shrinking the entire image. That is, a detailed print on a DLP printer must only use a fraction of the overall build area, and large models can only print at a coarse resolution. DLP 3D printers are restricted by pixel size. A printer that has a large build volume has a fixed amount of large pixels, making it impossible to print small details at full build volume. A laser SLA 3D printer’s build volume is completely independent from the resolution of the print. A single print can be any size and any resolution at any location within the build area. Because objects are made of layers in 3D printing, 3D prints often have visible, horizontal layer lines. However, because DLP renders images using rectangular voxels, there is also an effect of vertical voxel lines. Notice these lines in the photo below. Look for vertical lines on the surface of DLP 3D prints. DLP 3D printers render images using rectangular voxels, which causes an effect of vertical voxel lines. In this image, see the vertical voxel lines as they appear naturally on the left, and then outlined to more easily identify on the right. Because the unit is rectangular, voxels also have an effect on curved edges. Think of building a round shape out of Lego bricks—the edges will appear stepped on both the Z axis and the X-Y plane. The rectangular shape of voxels makes curved edges appear stepped. Removing the appearance of voxel and layer lines requires post-processing, such as sanding. Want to evaluate SLA parts firsthand? Request a free sample part!